Are you sick of going crazy over your kids’ birthday parties? There is a better way to plan a birthday party, and it only takes 10 simple steps. They don’t do anything until the last minute. What if I told you both of these strategies is wrong? If you’re one of these parents, you’re not alone. Over-the-top parties are my thing. I love to see an awesome event pulled together. My oldest’s first birthday party took six months to plan and prepare (these were the days before Pinterest, too!). And her fifth birthday took more than a week to set up. Parents rave about these parties, and it’s an incredible feeling to so much hard work turn into a reality. Then again, I’ve done the last-minute party, too. Last year, I was eight months pregnant when my oldest turned 6, so there was no energy to spare for a lot of extra projects. And the venue we were at only allowed two hours from the start of set-up to the time we had to be out the door. Another cute party, but also incredibly exhausting. You don’t have to operate at these extremes to plan a birthday party for your kids that they love and cherish. There is a middle ground. Plan a party the smart way so you’re not racing to finish decorating as guests arrive on your front step. Aim to start planning your event about six to eight weeks in advance. Generally, invitations should be sent to out of town guests at least four weeks in advance; six weeks is best. Starting to plan a party more than six to eight weeks in advance, however, can lead to the rut of wanting to do too much. Have a brainstorming session (or two). Sit down once to come up with your budget, party theme/colors, time of day, number of guests, menu planning, decor, and set-up. Before finalizing any decor or food plans, go shopping to get an idea of what’s available and what inspires you, but don’t buy anything yet. Add whatever ideas you came up with to your brainstorming notes. Make a checklist of projects. Go through your brainstorming notes and pick your favorites, making a checklist of all the projects that need to be done. Estimate how much time and money each project will take to complete. If you’re hosting the party at your house, don’t forget to include checklist items for cleaning. Choose just one area to spend your time and energy on. Again, choose just one area to DIY. Do you want to make awesome decor, or do you want to create delicious food? Unless you have a large group of people helping to put it all together, don’t try to do both. Eliminate the projects that aren’t in line with what you chose to prioritize. Replace those projects with something store-bought or simplified. Remember, you can have the most incredible idea ever, but if you don’t have the time to execute that in addition to everything else, it’s likely to be more stressful than impressive. Find a place to keep notes of your ideas, and modify it for another occasion. Make use of what works for you. Aim to fill at least 50% to 75% of your checklist with your tried-and-true recipes/projects. If you’ve made something before, you’ll know how much time, effort, and cost will be needed to get it done. Chris, from Celebrations at Home shared how she keeps track of these with her party journal. It’s a great way to keep track of not just what works and what doesn’t, but also to keep track of special memories. Be flexible, if it means simplifying your plan. When you’re out shopping, take a look at what stores have that might be a good replacement for something you had planned. For example, I was out at Target the other day and happened to find a snack that will fit in perfectly with L’s party theme, and will take little-to-no time to prepare. I snatched up a couple bags and merrily replaced a homemade snack option with what I purchased. Get started early on projects that can be made in advance. Have a craft that you want to make and use for the party? Aim to have all crafts done 10 days in advance of the party. That way the rest of the time can be spent on cleaning and food preparation. All my kids were born in the summer, which means I try to plan almost all of their parties outside. But sometimes they get rained out, and that’s just fine. I’ve always got a plan in mind for how to set up our party if it has to get moved indoors. Outdoor activities are easily replaced with indoor party games, board games, or even free play with your kids’ toys. The most important thing is that you and your guests have a wonderful time. Don’t try to overwhelm yourself with too much. People won’t always remember what the decorations looked like or what food was served, but they will remember if you’re too stressed to spend time with them. Don’t fall into the trap of planning too much too early. And don’t leave everything to the last minute either! 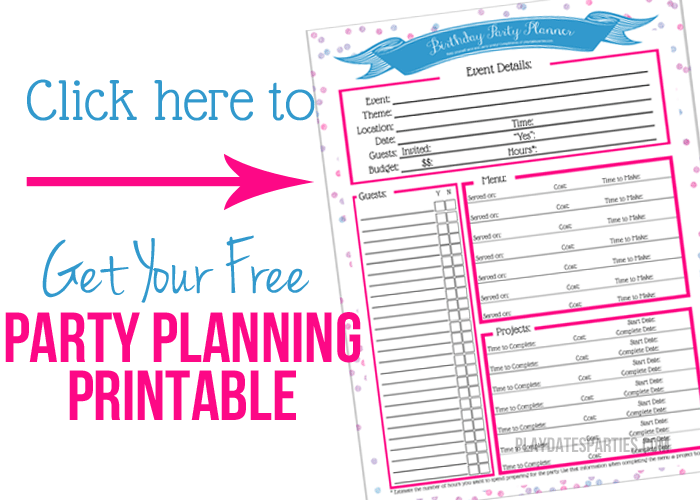 Grab your free birthday party planner by filling out the subscription box below. Then, follow these 10 simple steps to plan a birthday party without losing your mind, and host the best party your kids ever had! 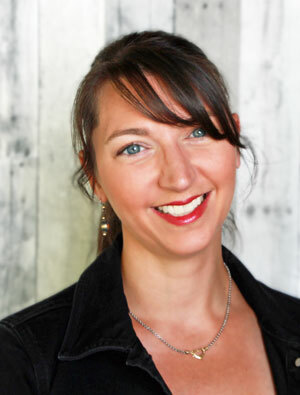 What is your party planning style? 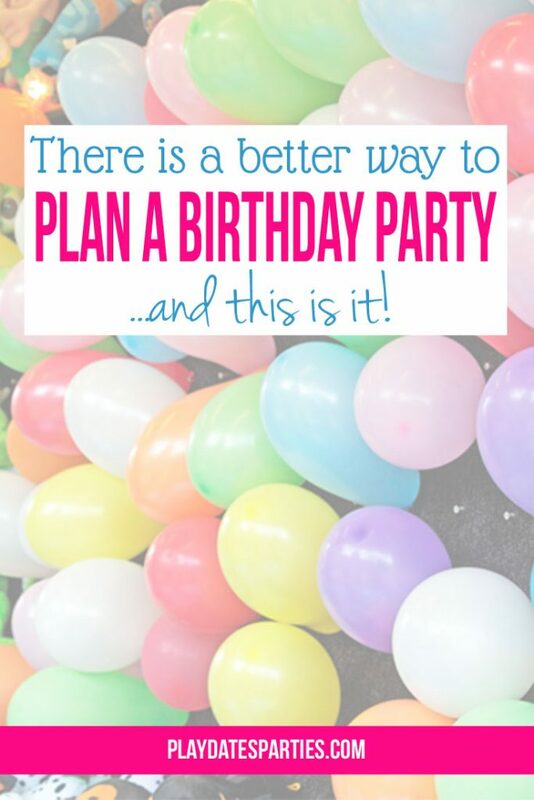 Do you have any extra tips to help plan a birthday party? We have such a similar thing here. So many spring/summer birthdays. Tons! And we do get overwhelmed in the details. I’m printing this out, after pinning it, of course. Thanks so much Tamara. I hope this system works for you! Agree with all of the above! Great suggestions. I love ‘have a backup plan’ because we end up needing to rely on that a lot for the small and big things come day of party :). Oh yes, a backup plan is a necessity. It doesn’t have to be complicated, either. You guys have the perfect season to throw those 10 parties! Our birthdays are scattered throughout the year, and sadly no summer ones 🙁 You do a great job of throwing parties, Leslie! Can’t wait to see what you do this summer. We have family members with winter birthdays too, and that’s a totally different ballgame! It sprinkled on us a bit, but not enough to go inside. Let’s hope the weather isn’t any worse than that for the kids’ parties this summer! Amen on the backup plan! Having one has saved me many a time. Our birthday parties are all year long. We do have 2 in a row in the summer, but that is it! Luckily, my kids are easy to please and that makes it easy! Having two in a row can be just as stressful, because everything happens at once! T and E’s birthdays are less than a week apart & it will be interesting to see how we manage it all. At least they’re not on the same exact day like my Husband and his brother! We just had a big backyard party for Gwen’s graduation, so the only thing I would add is watch how much food you make or order! Turns out Wegman’s estimate of how much their deli platters will serve is much too low! My kids have August birthdays less than three weeks apart, but I actually found it easier to plan two so close together. You are such a gifted natural at this Leslie, I’ve said a million times I’d pay for your services!! you should consider opening up a biz. You are SOO good! Great tips & reminders! I especially relate to being flexible and not sweating the small stuff. I just had a graduation party for my daughter and was stressing over finding pink plates and finally went with some pink plastic ones I found at the Dollar Tree. But, when I got home and opened them, they looked more like frisbees, not plates and I wasn’t real happy about it. But, I went with them anyway, and in the end it worked out just fine and everything looked really festive and we all had fun, which was the main goal, anyway.